Have you all had enough of salads yet? We’re a little over a week into the new year, and I’m sure those healthy resolutions are wearing mighty thin if you’ve sworn to consume only kale and smoothies in an attempt to reset your body after all that holiday indulging. But I have good news! You’re not bound to only salads in order to eat healthy. 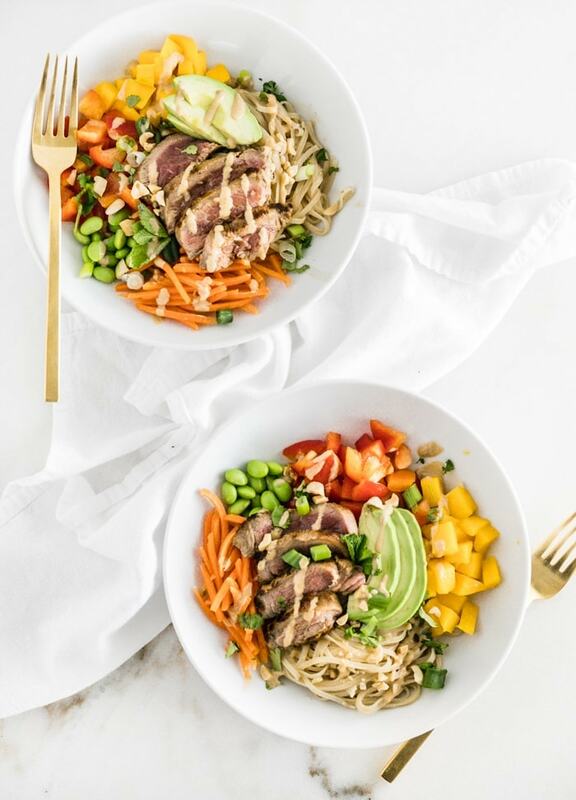 Exhibit one, this Thai mango steak noodle bowl. 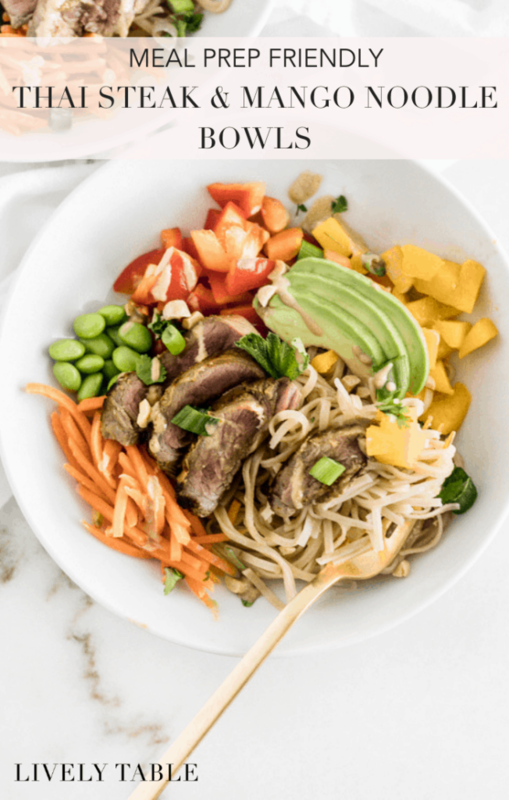 This delicious noodle bowl has lean protein, whole grains, fruit and vegetables all in one, making it a no-brainer when it comes to eating healthy. I love simple meals like this that you can throw in a bowl and call dinner. This one is deceptively tasty, too. This healthy meal is so easy to throw together on a week night, too. Just prep all of your ingredients while the steak is marinating, then boil the noodles while the steak rests. Then all you have to do is put it all in a bowl and enjoy! What could be easier? 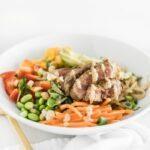 This noodle bowl is also a great meal prep dish. It tastes great both warm and cold! 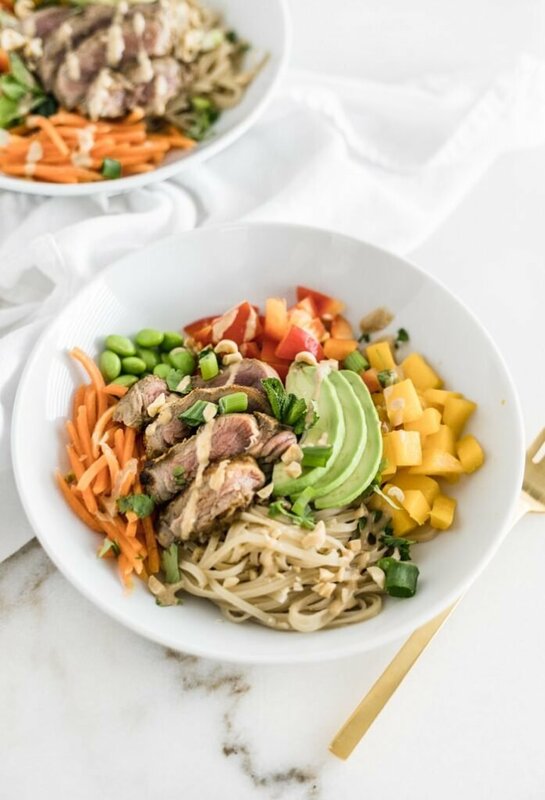 If you’re tired of salads but still want to eat healthy, try this Thai mango steak noodle bowl. It’s a welcome change from kale smoothies for week 2 of the healthier new year. 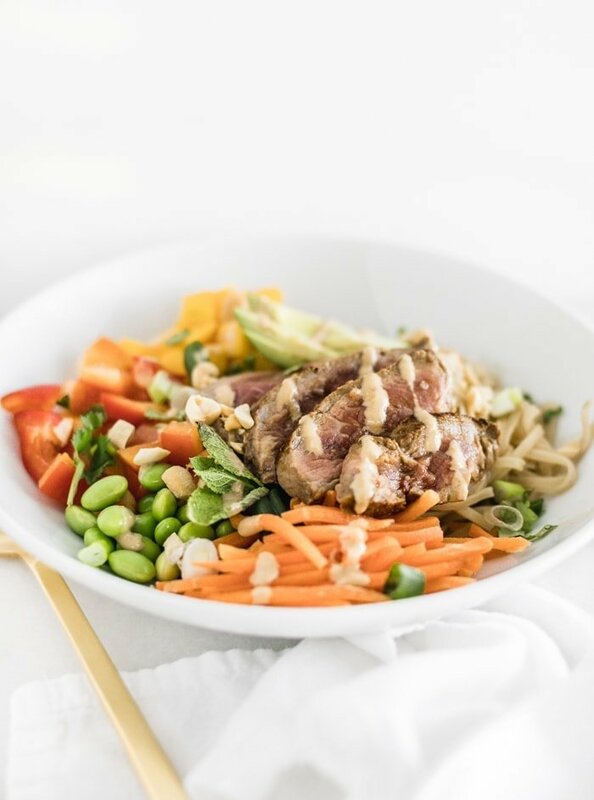 This healthy Thai mango steak noodle bowl features tender soy-marinated steak on a veggie-filled brown rice noodle bowl with a delicious ginger sauce. (gluten-free option, dairy-free). Trim excess fat or silver skin from steak. Place steak in a large zip-top baggie with soy sauce, ginger, garlic and pepper. Place in the refrigerator and let marinate for about 1 hour. Meanwhile, dice mango and red pepper and shred carrots. Cook edamame if frozen. Whisk together all sauce ingredients. Remove steak from the refrigerator. Preheat a large skillet over high heat. Once hot, add sesame oil. Sear steak for about 1-2 minutes per side. Remove from heat and set on a plate to rest. While steak is resting, bring water to a boil in a large saucepan and cook noodles according to package directions. Drain and toss noodles with the sauce. To assemble bowls, split noodles between 4 bowls. Divide mango, pepper, edamame and carrots between bowls. Top each bowl with sliced steak and sprinkle with fresh herbs. Serve hot or refrigerate for up to 4 days. *For gluten-free, use tamari instead of soy sauce. These bowls look DELISH!!!! But I have to say I’m loving that gold silverware even more!! 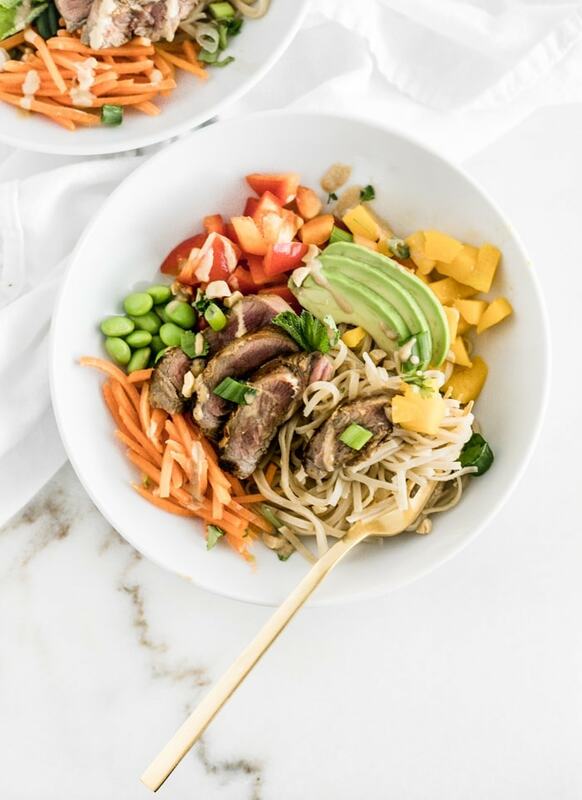 All my fave foods in one bowl, seriously: beef, mango and edemame! Love the amazing pics too!